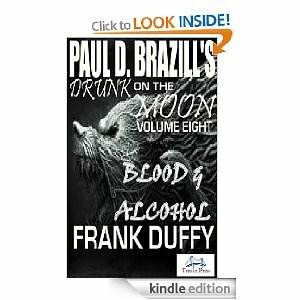 The eighth instalment of Drunk On The Moon - Blood and Alcohol comes from Frank Duffy. For those that have yet to come across this series of short stories they feature a private eye, Roman Dalton, who happens to be a werewolf. The genre has been dubbed werewolf noir by lovers of the series. Each story is written by a different author but all feature the hapless, if somewhat deadly, Roman Dalton as he is thrust from one dangerous adventure to another. The diversity of authors has led to a wide range of exploits but all have been, for me, very enjoyable. Paul D. Brazill has picked his contributors with care. The authors have treated his creation with respect and kept the style and theme of the stories within the dark, gritty style of the original story. Men who dance on the decaying underbelly to the staccato beat of its nightly violence. Men like Roman Dalton. The threat to Dalton in this instalment comes from a most unexpected source. The legend of Roman Dalton continues to grow in fever and intensity. A thoroughly enjoyable short story and a series I would recommend highly to lovers of dark fiction.